Lawyers for Joaquín “El Chapo” Guzmán made their closing arguments Thursday, as the trial of the notorious drug kingpin draws to a close. The 61-year-old faces ten criminal counts related to running a criminal enterprise, trafficking drugs and guns, and money laundering. If convicted, he could go to prison for the rest of his life. • El Chapo loved guns, especially those tricked out with diamonds and gems. His favorite, according to El Mayo’s brother, Jesus “El Rey” Zambada, was a diamond-encrusted .38 with “JGL,” Chapo’s initials, spelled out in other gems. Chapo also owned at least two other bejeweled pistols and a gold-plated AK-47. • Chapo once escaped the Mexican marines, who had tracked him to a safehouse in Culiacán, through a tunnel that was accessed by lifting a bathtub with hydraulics. He was naked the whole time. • Chapo had another tunnel that he used to run drugs across the U.S. border. This one was 50 feet long and accessed below a pool table. It was also outfitted with carts that drug runners used to deliver cocaine from Mexico to Arizona. • Among the many ways Chapo’s cartel smuggled drugs was through the air, in a carbon-fiber airplane designed to evade radar. 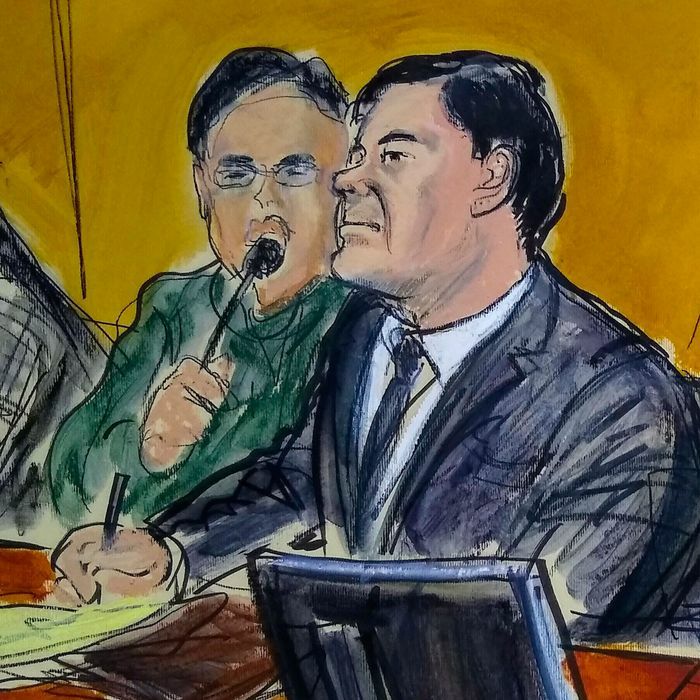 • Alex Cifuentes, a Colombian drug trafficker, told the court that Chapo once bragged about paying a $100 million bribe to former Mexican president Enrique Peña Nieto. A spokesperson for Nieto said that wasn’t true. • Cifuentes also told the court that Chapo was protected by dozens of guards while he was hiding out in Sinaloa. Around 50 men, living in “humble pine huts,” formed three rings around Chapo’s home to keep him safe. • Miguel Ángel Martínez, an onetime Chapo ally, told the jury about how the kingpin spent some of the billions he made from the drug trade. Among his indulgences was a personal zoo complete with a small train, lions, tigers, and panthers. • Chapo also once traveled to Switzerland to receive a “cellular youth treatment,” Martínez claimed. • Internet service in mountain hideaways can be unreliable, so Chapo hired a young IT guy in 2008. Christian Rodriguez would build an encrypted communications network for members of the Sinaloa drug cartel, install spyware on the phones of Chapo’s wife and mistresses, and eventually give the FBI access to all of his former boss’s communications. • A onetime member of the Mexican military who later became Chapo’s pilot, Valdez Rios also told the court that he saw his former boss beat two men with a tree branch until their bodies “were completely like rag dolls.” Then he shot the men and had their bodies thrown in a bonfire. • Chapo once ordered a man killed because he refused to shake his hand. • Antonio “Jaguar” Marrufo, who worked as a hit man for Chapo in Ciudad Juarez, had a soundproof murder room in his home, one witness told the court. The white-tiled room had a drain in the floor for easy cleanup. “That’s where he killed people,” Edgar Galvan, a former drug runner, said.